The Nordic® air to air heat pump is an air source heat pump designed to work in a residential setting. 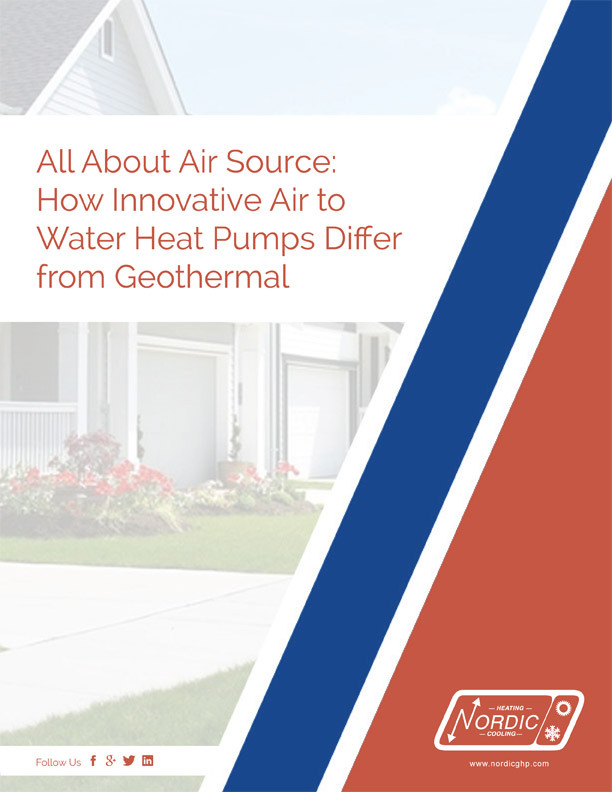 Since the heat of heat for this heat pump is the air, there is no ground loop required, which means this system is very cost effective to install. Our air to air heat pump (ATA Series) heats and cools air for whole-home forced air heating and air conditioning. This air source heat pump is a cold weather heat pump which means it has been optimized to work even in the coldest Canadian climates (down to -4°F or -20°C) after which point the built-in backup heat takes over. This heat pump has many features that allow it to perform very well in cold Canadian weather including featuring an oversized outdoor unit designed to maximize heating capacity in winter and intelligent defrost logic, which minimizes the energy required to defrost the outdoor coil, improving efficiency. Like all Nordic air source heat pumps, the compressor and other major components of this heat pump are located inside the home, which greatly increases the longevity of the machine and makes it easier to service in the dead of winter. The ATA Series is available in sizes up to 6 nominal tons, so one machine can provide whole-home heating and cooling. Indoor unit has industry leading 24″ x 28″ footprint. Air discharge is field changeable from top to side. Both indoor and outdoor unit fans are true variable speed with ECM-style motors, for comfort and energy efficiency. Outdoor ice channeling design means no bottom tray and an angled outdoor coil eliminates ice build-up. Copeland Ultratech® two-stage scroll compressor is located in the indoor unit for ease of cold-weather service and better refrigerant/oil management. Gen2 electronic control board has external user interface and includes outdoor reset function, data logging, internet and laptop USB connections and BACnet interface. Electronic expansion valves for precise refrigerant control. Start capacitor kit and suction accumulator are standard equipment. Domestic hot water generation – an exclusive Nordic® feature in the air source market.